The All Progressives Congress (APC) has said that Peoples Democratic Party (PDP) is already conceding defeat. The All Progressives Congress (APC) is amused by the interest the Peoples Democratic Party (PDP) has in the mode of election the APC chooses to adopt for Primaries to elect Party candidates for the 2019 elections. The statement signed by Mr. Yekini Nabena Ag. National Publicity Secretary further said that Direct Primaries among others ensure fairness; creates a level playing ground for contestants; eliminates corrupt tendencies usually associated with the delegates system and ultimately ensure full and direct participation of party members at all levels in the election of Party candidates. 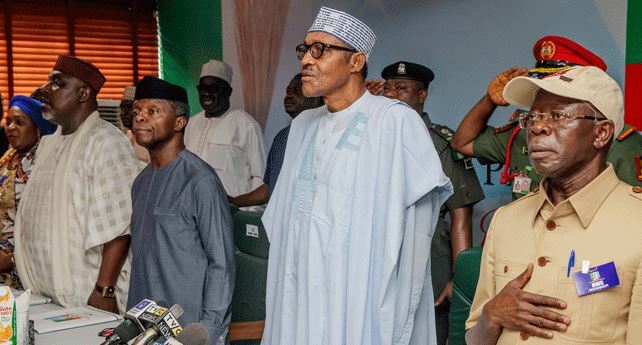 With over 13 million registered APC members coupled with a large section of nonpartisan Nigerian electorate supporting the President Muhammadu Buhari-led APC administration, it would seem that the PDP on account of its attack of APC’s adoption of Direct primaries particularly to elect its presidential candidate, has already conceded defeat even before the 2019 elections. We quite understand that the revolutionary and progressive idea of Direct primaries to elect party candidates is strange to the PDP — a Party known for its inability to ensure internal Party democracy and actively promotes imposition of candidates against the will of its members. Direct Primaries among others ensure fairness; creates a level playing ground for contestants; eliminates corrupt tendencies usually associated with the delegates system and ultimately ensure full and direct participation of party members at all levels in the election of Party candidates. The APC is a Progressive Party and will continue to implement the Change Agenda promised to Nigerians. We urge Nigerians to continue their support as the President continues to rebuild and reposition the country. How can we repair what is incorrect with Indian universities?